In an effort to learn how nib grinding can successfully transform an undesirable nib size into the nib point of one's dreams, I decided to pursue an economical project to gain some experiencing with reshaping nib points. I wasn't about to use pens from my beloved collection, because even my cheaper fountain pens already write well, and I am not ready to risk grinding a nib into oblivion. So, I knew Pilot Varsity pens come in a standard medium, allowing me plenty of grinding enjoyment to rework the nib into a fine, extra fine, maybe even a fine Italic. I went to Amazon and was able to find a box of one dozen Varsity pens for $23.83 (U.S.). Yes, this is still nearly 24 bucks, but it is about as cheap as it gets for a dozen, and I get all of the ink inside the pens. As a side note, the Pilot black ink in these pens is very well behaved and nice and dark. It is a great general black ink. I didn't have any empty ink bottles, so I went to Goulet Pens and ordered an empty Noodler's Ink bottle for $1.00 in the clearance section. He goes through a ton of ink with Ink Drop and the sales of samples, so if you need extra bottles, you can get them there (no affiliation, yadda yadda). What you wind up with is a pile of eyedropper barrels, caps, and medium point nibs/sections. Because the ink inside the pens was black, it took a good deal of rinsing in cold water to get all of the ink out. I then let this mess dry on a few sheets of paper towel overnight. The nibs are somewhat difficult to pull out, so I used a clean washcloth (one that you don't care about ruining) to firmly grab the nib and section, and then I gently pulled these out. They are in there firmly, for obvious reasons, but you just need to pull and twist at the same time. Be careful, they are filled with ink, so do this outside or over a utility sink. Once you've removed a few, it will get easier to use the proper strength/motion to take out the rest. For the actual grinding, I have a few different grinding sticks (glorified emery boards/nail files). The larger ones are 200 grit and 400 grit, which my girlfriend acquired from a beauty supply store, and the smaller one (bottom) is a Micro-Mesh Buff Stick from Richard's Pens. The Buff Stick has a 2400 grit portion, a 4000 grit portion, and a the grey side (shown above) is 12,000 grit. Between these sticks, I should pretty much have my bases covered. Another important thing to consider is that the nibs are steel, so it takes a good deal of grinding to bring these down, especially if you want a XXF (extra extra fine). I may even end up using a rotary tool on these, but I don't want to cut the pens in half, so I will be starting with the sticks and stepping it up to a rotary tool if I need to. So, there you have it. Gathering the materials required three separate orders from online retails and one purchase from a physical store, but this should be a incredibly time-consuming fun and rewarding project. I will keep everyone posted on the results once I finally start getting some of these to write fine and buttery smooth simultaneously. If you have any questions, let me know. Grip: The grip, if you can call it a grip, is hard plastic with small, slightly raised rings. While the rings may prevent slippage, they are somewhat awkward. The pen is still fairly comfortable to hold. Clip: The clip is metal and feels pretty solid. It doesn't budge very much at all. Color and Design: The color of the barrel and ink remind me a lot of the Uniball Vision Elite Blue-Black. Both pens have white barrels, rollerball points, and dark blue inks. The grips and overall design look close to one another. Performance: The ball of the pen is about as smooth as it gets, which it should be given the .7 mm size. The lines are clean for the point size and there was no skipping or uneven ink distribution. Drying time: The ink took somewhere around 20 seconds to dry on Rhodia paper, but many liquid inks do. Recommended? Yes, if you like larger point sizes and liquid ink roller ball pens. This one is not bad, but it is not a style I typically go for. I don't know how well it will show here, but the trim is much lighter than the ink. 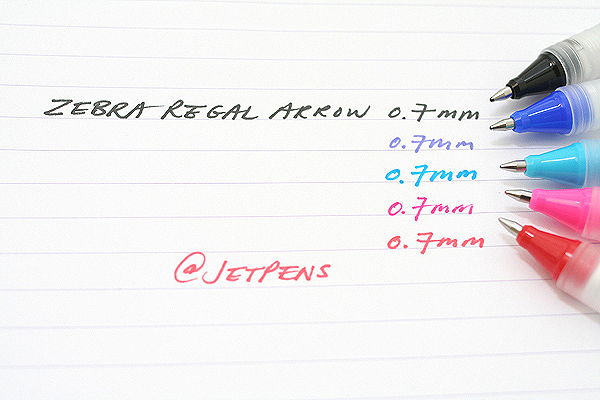 The Zebra AR7 ink was darker than the Uniball Vision Blue-Black ink, which is surprising being labeled 'blue'. It looks as if Zebra was borrowing some design elements from Uni-ball for this one. The grip, trim, barrel color, and clip are all pretty similar, but I think the Zebra is a bit smoother. The AR7 ink looks much brighter in the Jet Pens image, so I wonder if the color of the ink has changed in the barrel, which I have seen happen with Waterman South Sea Blue (if you don't use a pen loaded with Waterman SSB often enough, the color shifts from turquoise to dark blue). If you like rollerball pens and .7mm point sizes, this one is worth checking out. It is currently $1.80 (U.S) on Jet Pens (no affiliation). The May Carnival of Pen, Pencil & Paper Has Arrived! Goldspot Pens knows there are all sorts of pen collectors out there, and they want to hear from everyone about their collections: How Do You Collect Pens? DianeB, of Pocket Blonde, submits an article from 777 Pen Repair which compares the Lamy Safari to the Esterbrook J. From the Desk of Janet Barclay presents the article Papermate Produces My Favorite Pen. Rants of the Archer has this article on the Quiver Pen Holder. Julie (O-kami), of Whatever, presents the Pelikan 140. Seize the Dave presents a review of Noodler's Dragon's Napalm as well as a review of Noodler's Black Swan in English Roses. Inkophile loads up a Platinum Preppy with Noodler's Bay State Blue. The Pen Addict reviews the Levenger 4x6 Note Cards. I haven't tried any Levenger products yet. Does anyone have any other feedback on these? Office Supply Geek reviews the Large Saddlback Leather Briefcase in Dark Coffee Brown. Note Booker, Esq. poses the question, What's Better Than Getting a Bunch of Ink Samples in the Mail? Brian Goulet, of The Goulet Pen Company and Ink Nouveau, demonstrates how to use the Feed Saturation Pen Filling Method. Pen'n'Paper reviews a cool little notebook, the Midori Traveler's Notebook. Penned House reviews the Staedtler Triplus Fineliner. Writing and Scribbling presents a review of Diamine Poppy Red. Check out this review of the Pilot Prera Clear Body Fountain Pen from Pocket Blonde. A Penchant for Paper takes a closer look at the Sharpie Pen RT in Blue. Dave's Mechanical Pencils reminisces on The Good Old Days (of pencil leads and pencil lead containers). Julie (O-kami), at Whatever, demonstrates Letraset and Doodletuts. PenInkcillin provides an in-depth look at the TWSBI Diamond 530 EF loaded with Noodler's Polar Brown. does this pen write? wants to know - Fresh or Tired: Gelly Rollers! And there you have it. I hope you enjoyed the May Carnival of Pen, Pencil and Paper. 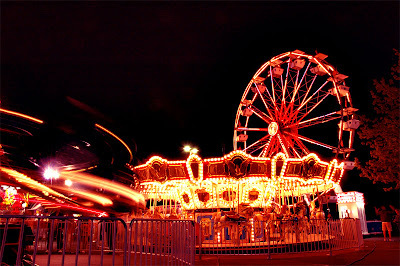 A big thank you to Nifty of Notebook Stories for allowing me to host this month's Carnival. The June edition of the Carnival of Pen, Pencil and Paper will be hosted by Note Booker, Esq. 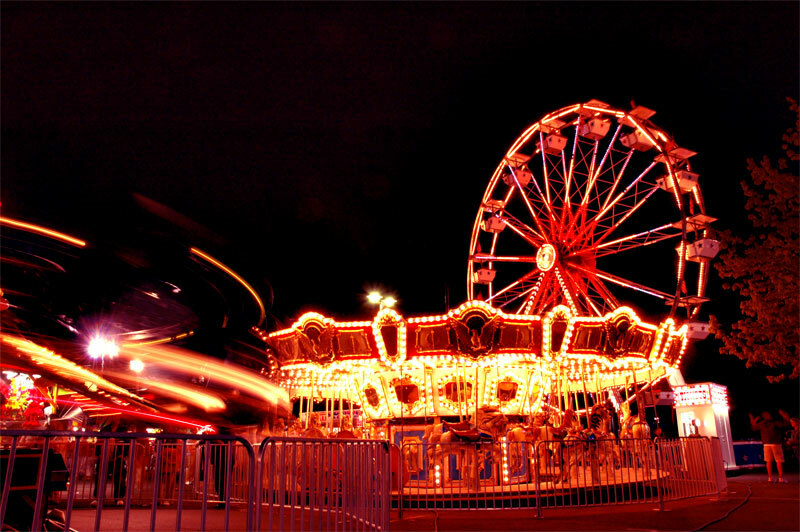 Use this submission form to get your entries in for the June Carnival. If you have any questions about how to submit your entry or about the Carnival, please feel free to contact me.